He did this the Sunday before last. 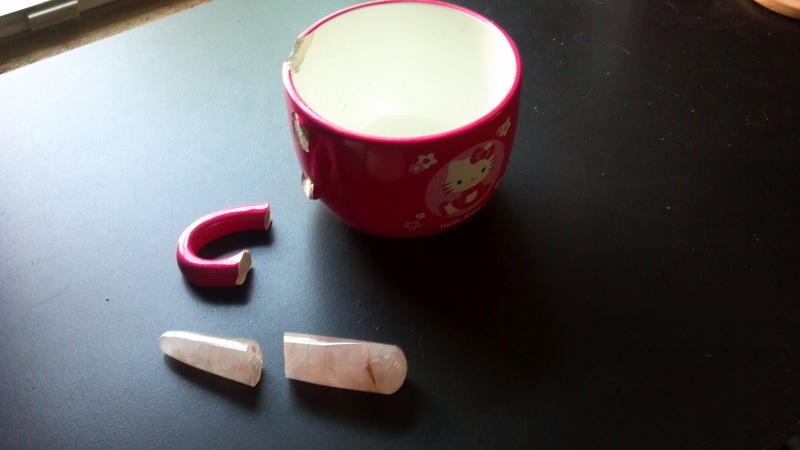 (I have two HK mugs I keep my crystals in on my desk.) I have already been to Wally World and replaced the broken mug. However, still trying to find a new rose quartz wand. The one I got today that I ordered on eBay isn't exactly right. It's longer (5.05" is the new one) than mine, and it's skinnier. So...the search is still on. I got my old one at a flea market vendor for like $20, so I'd like to stay in that price range or less. If anyone has any leads, I'd greatly appreciate it! The new one (longer and skinnier) is 5.05", so my old one is shorter than that, but thicker. In fact the fat end of my old one is almost squared off, if that makes sense, even though you really can't tell in this pic. AND, before you dirty-minded pervs (did I mention I lurrrrve you all? LOL) get the wrong idea, what I do with this is it usually sits beside my laptop when I'm writing. When I stop for a moment to think or read back, I roll it between my palms. The new one's okay, but it just doesn't feel the same. So, if anyone has any ideas on where I can find one closer to the one Grimmy broke, I'd appreciate it. Yea... it looked bad. But you complaining about the thickness didn't help hehe. 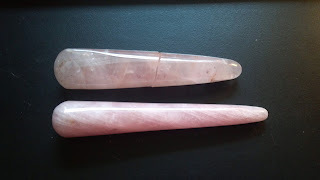 Rose quartz has healing properties so it probably helps your concentration when you write. you should get a piece of jewelry to wear close to your heart or on your wrist. @Carin - I do have other pieces of rose quartz, and two bracelets, but the bracelets bother me while I type.